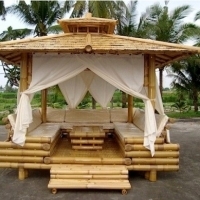 Dear Sir and Madame,we are company from Indonesia,offer to sell BAMBOO GAZEBO,we can supply and produce depends on your instructions,for more details please don't hesitate to contact us. Lumber size Gazebo - Column 140mm x 140mm - Column 90mm x 90mm - primary runnersor floor joists 50mm x 125mm - secondary runners of floor joists 50mm x 125mm - tongue-and-groove walling 16mm x 130mm - tongue-and-groove walling 16mm x 90mm - top plate 50mm x 90mm - rafters 50mm x 90mm - flooring L 24mm x 140mm - flooring L 24mm x 90mm - primary roof runners 50mm x 90mm - secondary roof runners 40mm x 40mm - tongue-and-groove ceiling 90mm x 10mm - door frame 90mm x 90mm,45mm x 90mm - door standart nyatoh wood - windows frame 90mm x 90mm,45mm x 90mm - windows standart nyatoh wood. Gazebo 25 units / countainers. Size: 4mtr x 4mtr Wgt: Approx 900KG Wood: Accasia (Hard wood) Finish: Water proof Melamine CBM: 13 cbm Product : Gazebo 4 Packed in Corrugated boxes & Assembling is easy. Custom changes are possible. Its roof is in four part, if need it can increasing the size adding 2 extantion parts, 8 pillars and 4 arch, all fix with mm size nut and bolt. If full container than pack in bubble & corigate. If lcl pack in wooden carat. Short on time? Let gazebo sellers contact you. 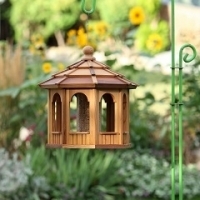 Description : Poduct name	: Gazebo_1 Length	: 380 cm Width	: 265 cm Heigth	: 290 cm Price	: Rp. 10.500.000 Notes	: 14x14 cm (Post dimension). Shenzhen Yashang Tent Co, Ltd.
Ningbo FTZ Jucheng Co., Ltd.
1) Size: 400cm dia or customized 2) Material: available marble,sandstone, travertine, granite, limestone 3) Color: white, yellow, red, green, black, coffee and so on 4) Surface finishing: polished, honed , ect 5) Packing: wooden crate 6) Carving: Hand carved 7) We produce many type of carvings, such as Fountain,Fireplace,Gazebo,Statue and Sculpture,Flowerpot,Columns Balustrade,Abstract Sculpture,Bust,Relief,Stone Table,Bathtub,basin,animal,door surround,mosaic,table and chair,bronze sculpture,iron sculpture,art clock.park bench,streetlight and so on. 8)We can supply many kinds of carvings in different color ,material and size. 9) payment :by T/T 10) transportation :by sea 11)delivery time: about 45 days. Wooden crate. Gulf Dexin Trading FZ Co. Size 2, 5 x 2, 5 Knockdown system and easy to install. Solid wood. Long life time : more than 25 years . Packing with corrugated carton. Shenzhen Yashang Tents Co. Ltd.
ò	However, it also can thoroughly to face large-scale activities when it combined with several cells into a variety of square matrix ò	WhatÆs more, it shows unique and special ò	Due to the combination of changeful display to make the imagination more attractive ò	Gazebo has a wide range of application of its own, so itæs better to perform various commercial activities colorful, and more wonderful ò	The frame of the tent adopt high reinforced aluminum alloy, no pillar in the middle space the fabric adopt PVC coated-polyester, which are full UV protection, flame retardant, waterproof, and weather resistant ò	The main profile of the tents adopt high reinforced aluminum alloy GB/T-6061 or GB/T-6063 standard ò	The fabric adopts PVC-coated polyester, which are full UV protection, flame retardant, waterproof, and weather resistant ò	The fabric is mainly in white, transparent or not ò	The fix fashion is related to the installation ò	If the ground (cement floor tarmac floor) can use the expansion screw to fix ò	Without any fee (the fee is contain in the quotation) ò	If the ground is the loose ground (such as the sand and grass) ò	If the ground can't damaged (such as marble and tile), it must use the loading system ò	Yashang tents safe and steady, solemn, and elegant, it suitable for structuring of every venue, flexible and convenient ò	The tents can be widely used for holding different outdoor exhibitions, celebrations, business gathering, business promotions, sports affairs, tourism and leisure, industrial warehouse, military use, as well as relief and various temporary events ò	Accept the baptism of wind and rain, perform infinite possibility together . ò	Frame material: high-strength aluminum ò	Connectors: zinc powder-coated steel and rust resistant ò	Fabric: PVC-coated polyester textile, cover 950g/m2, sidewall 630g/m2 and color mainly in white ò	UV protection, flame retardant, waterproof and weather resistant ò	Span width: 8m ò	Bay distance: 3m ò	Length: unlimited and flexible (modular structure, provide maximum unobstructed interior space) ò	Side height: 2.6m ò	Peak height: 4.0m ò	Main profile size: 84 x 48 x 3mm ò	Can make according to client's requirements . PVC-coated Polyester Fabric and Flame Resistance. Pdyear Display And Service Co., Ltd. Pop up gazebos Item name: pop up gazebos Item no: pp-f001 Size:3x3m(you can choose the size by yourself) Shelf material: steel or aluminum Cover material: 420d or 600d waterproof polyester. Remark : 1. We can print the picture as your request. 2. Folds for easy moving and storage. 1 set /carton. Outdoor White Stone Gazebo Sculpture 1. Material:100% natural Marble 2. Made by hand carved 3. Style:Garden Gazebo 4. Customized designs are available 5. MOQ:1set 6. Application: Outdoor or Garden Decoration Our main products include: metal carving, metal sculpture, stone carving, stone sculpture, like: fireplace, statues, Animals, religions, fountains, garden landscape. Strong wooden crate with plastic film or foam inside.